When actress Annette McLaughlin was a child she had a dream – to be a ballet dancer. She trained, she studied, she worked hard to achieve that aim but then she faced bitter disappointment when the Royal Ballet turned her down. Which means Annette, who has carved out a hugely successful career as an actress on stage instead, understands the yearning in Billy Elliot, the boy who wants to dance. Annette is currently playing the role of Mrs Wilkinson, the dance teacher who sees the magic in the young Billy, in the UK tour of Billy Elliot the Musical. Based on the 2000 film, Billy Elliot the Musical, which comes to Birmingham Hippodrome this March and April, tells the story of a young boy's dream to become a ballet dancer despite the initial opposition of his family. Set in a northern mining town during the 1984/5 miners' strike, Billy's dream ultimately inspires not just his family but his entire community. Annette's memories of the hunger to dance have helped her shape the role of the chain-smoking, wise-cracking Mrs Wilkinson. "I desperately wanted to be a ballerina when I was a child," she says. "I was a junior at the Royal Ballet, along with Christian Bale might I add - he was the only boy in the class, our very own Billy Elliot. I desperately wanted to get into White Lodge, the Royal Ballet School which Billy auditions for, but I didn't get in. Instead I went into acting and singing although I still kept up the dance." In the event Annette believes acting proved to be the better route for her than ballet, with theatre roles as varied as Mrs Wormwood in Matilda, Babette in Disney's Beauty and the Beast, Velma Kelly in Chicago and a 2016 repertory season at the Royal Shakespeare Company performing in The Jew of Malta, Love's Sacrifice and Volpone. She says: "I went to the London Studio Centre and that was like the Kids from Fame. It was amazing and we did all sorts of dance and singing. And there's more room for non-perfection in theatre than ballet so ultimately it was a lucky escape for me. Although there's still a little part of me that has that bit of disappointment as I wanted it so badly when I was 11." Perhaps it was Annette's passion for dance which meant the first time she saw Billy Elliot she knew Mrs Wilkinson was her part. "I have been a big fan of the film and of the show," she says. "I saw it very early on when it opened at the Palace Theatre in London and I just fell in love with it – it was such an amazing piece of story-telling. It's a universal story about family, being who you are and your passions in life. Mrs Wilkinson is a beautifully written part and the arc that she has in the storyline with Billy is something special. I identify with her character in so many ways. I faced that disappointment of not becoming a ballerina and I think there is a lot of that in Mrs Wilkinson. Then there is a bit of her in all my old dance teachers – that tough love that dance teachers have." And she adds: "I told my agent that I'd fallen in love with Mrs Wilkinson and he has always known that I wanted the part. I went and met with the director about seven years ago and I was told I was too young! I wasn't told that this time so I'm finally old enough to play her! Everything fell into place this time and to be the first person to take the part out on the UK tour is really exciting. Having been such a fan of the show for so long it's been great to be a part of it in so many cities." Premiered on the West End in 2005, Billy Elliot the Musical has enjoyed massive international success with audiences of more than 10 million worldwide and more than 80 awards. It ran for ten years in London before embarking on the UK tour and productions have been staged on New York's Broadway, in Sydney, Melbourne, Chicago, Toronto and Seoul. Created by Lee Hall and Stephen Daldry, it features choreography by Peter Darling and music by Elton John. The role of Mrs Wilkinson was played by Smethwick's Julie Walters in the Oscar-nominated and BAFTA-winning film but Annette wasn't concerned about her predecessors. "When you come to rehearse the character you find her from your point of view and you find things that you identify with," she says. "Everyone involved has wanted this show to be the very best it could be and in the rehearsals we never felt like anyone had played the parts before. We were always encouraged to find our own ways with the characters and to bring ourselves to the show. It's been a very creative process." She adds: "Mrs Wilkinson is brilliantly flawed, she's sarcastic but also funny and she has a lot of disappointment in life. But when she meets Billy and sees the talent and the passion in him something happens to her and the passion is re-ignited in her. In teaching him and helping him get to his audition, something comes alive in her. All those old passions that she had for dance come alive in her again. And the audiences also recognise her. She's all those teachers that we've all had that used tough love - who instead of saying 'well done' all the time said 'no, you can do better than that, come on'." Annette has been onstage in both Birmingham and Stratford-upon-Avon in the past so is looking forward to returning to the city when Billy Elliot plays Birmingham Hippodrome Theatre between March 7 and April 29. "I was at the Hippodrome in Crazy For You in the nineties, that was one of my first jobs," she recalls. "It was my first tour and I had a great time doing it, the Hippodrome is an amazing theatre. I also did Noises Off at The Rep about seven years ago and had a great time as the audiences really loved that show. I love Birmingham and we're there for eight weeks so I'm looking forward to really getting to know it again." 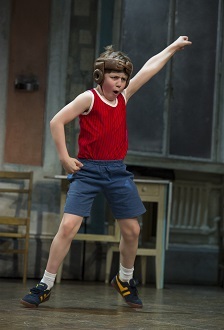 Billy Elliot the Musical plays Birmingham Hippodrome from 7 March to 29 April. See birminghamhippodrome.com for more information. I saw the musical a few years ago. It's very good. They probably have new kids playing Billy now.